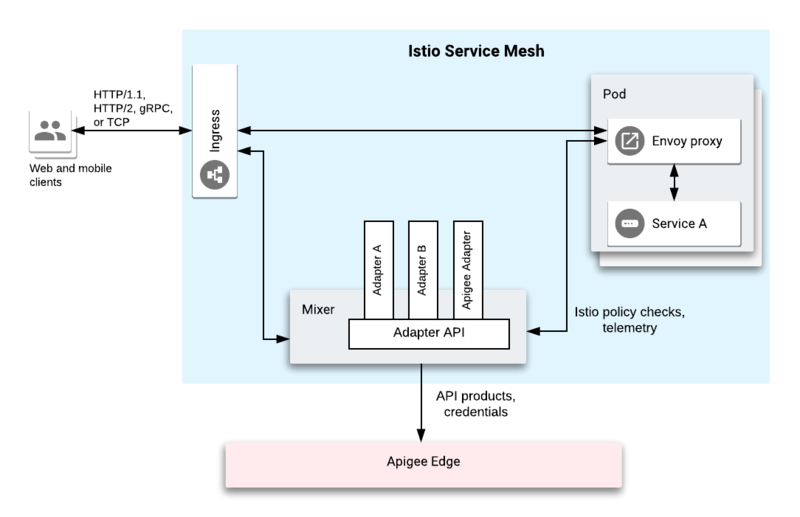 The Apigee Adapter for Istio brings Apigee API management to Istio. To learn more, see the Istio documentation. Apigee enables you to create APIs and share them with other developers who might be part of your organization or who might be external, or even unknown. API teams using Apigee achieve this by combining APIs into "API products" that offer different capabilities and levels of service. Apigee enables you to control who consumes each API product and how much is consumed. To learn more, see the Apigee Edge documentation. In addition, there are certain capabilities that you do not want to build for every service that you create and deploy to a service mesh. The adapter provides some of these capabilities, including security, caching, and quota enforcement. The adapter also pushes analytics data to the Apigee Edge Analytics platform. You can view this data using the dashboards provided in the Apigee Edge UI. For more about the benefits of Apigee API management for Istio, see the blog Introducing Apigee API Management for Istio. In the Istio architecture, an adapter is a custom component that plugs into an Istio component called Mixer. Mixer introduces configurable policies and control mechanisms that apply rules to traffic flowing through the Istio service mesh. In general, an adapter allows Mixer to interface with different infrastructure backends that deliver core functionality, such as logging, monitoring, quotas, ACL checking, and more. The Apigee adapter allows Mixer to deliver standard Apigee Edge API key, quota, and analytics functionality to services running in the mesh.